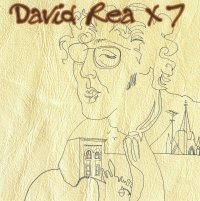 His seventh album was released in August, 2000 and is aptly titled, “David Rea – Times Seven.” With cover art work by his long-time friend Joni Mitchell, the CD provides a sort of retrospective. The cuts include never before recorded songs by both Ian and Sylvia Tyson, as well as classic Merle Travis tunes and original material by Gerry Sherman and by David, himself. The CD was recorded in Portland, Oregon, the place David now calls home, and features great backup work by a number of local musicians. "Hot pickin’ and some spiffy new tunes fill out “X 7,” his seventh album. David, who you will remember, co-wrote Mississippi Queen, Is a link to the Jimmie Rogers’ era of songwriters. He tells little stories about life, and wraps them up with some fine picking on his Martin. He is joined by Tom May on Irish whistle, Rick Young on bass, and vocal/instrumental group Shanghaied on the Willamette for a richer sound than he had on his last album. Here he sings songs by Merle Travis, Ian Tyson and even Al Jolson! But they all sound like David Rea. Check out the cover art, by David's longtime friend, Joni Mitchell!"